All Freedom Trail walking tours led by 18th-century costumed guides are available as private tours for families and individuals, school field trips, special events, and corporate team building, incentives, and convention activities. Private and custom tours may be tailored to fit any schedule and are available year round for any group size. Please Note: The Freedom Trail Foundation processes private tour requests during regular business hours (Monday through Friday, 9:00 AM to 5:00 PM). We recommend that groups submit a tour inquiry form at least one week prior to the date you are interested in booking a private tour. Our private tours are first-come first-serve, so please call or submit an inquiry form as soon as possible to ensure availability. Public tour tickets (including Go Boston) may not be used for private and custom tours. The Freedom Trail Foundation's most popular tour highlights the revolutionary history that took place at 11 of the 16 offical Freedom Trail historic sites, featuring Boston Common, Massachusetts State House, Park Street Church, Granary Burying Ground, King's Chapel & King's Chapel Burying Ground, Boston Latin School Site/Benjamin Franklin Statue, Old Corner Bookstore, Old South Meeting House, Old State House, Boston Massacre Site, and Faneuil Hall. 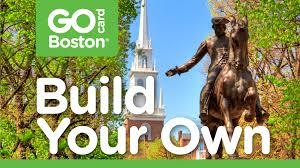 Enhance your Freedom Trail experience! Extend Walk Into History Tours by adding a visit to the North End on a 2 hour and 15 minute-tour featuring 13 of the 16 official Freedom Trail historic sites or enjoy a 3-hour full Trail tour featuring all 16 official Freedom Trail historic sites. Experience the Freedom Trail to its fullest by taking a walking tour with entrance to the Old South Meeting House, Old State House, and/or Paul Revere House. Each site visit adds 45 minutes to the popular Walk Into History 90-minute tour time. Must be scheduled 2 weeks in advance, and is based upon availability and the sites' capacity. All Freedom Trail Foundation-led tours are available as private tours. Private and custom tours may be tailored to fit any schedule and are available year round for any group size. A full listing of all tours can be found here.